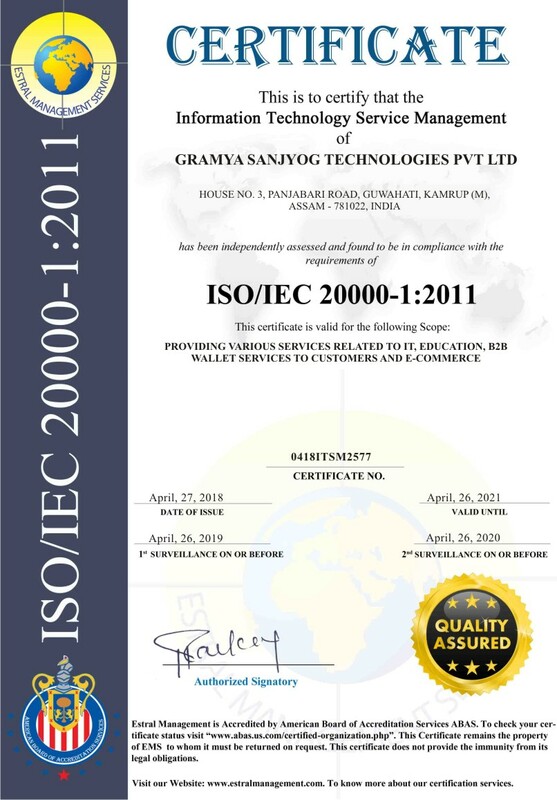 GRAMYA SANJYOG Technologies Pvt Ltd. formed in the year 2016 has been functioning with utmost dedication and sincerity to strive for excellence in the field computer education, rendering B2C (UTILITY) services, motivating rural youths for self reliance, promoting skill developmental attitude amongst citizen of all class and race. In order to create more scope of wide range services, we have already setup more than 300 computer centers in the rural Assam. Still we tend to accomplish setting up of one computer center in every GP/Taluka/VCDC in rural Assam in the long run. To mention farther more explicitly may we have the credits of NSDC program which we had successfully accomplished so far. We have also successfully executed the training program of e district project amongst the CSC and district govt. servants related to e district project. Also to add one more feat, must we intimate that all data entry operations relating to updating of details of newly applied posts of supervisors in the dept. of social welfare under the dept. of social welfare Govt. of Assam have also been performed by us. Presently we are engrossed in the ongoing projects of National Digital Literacy Mission (NDLM) as a Traning Partner introduced by the Department of Electronics and Information Technology, Ministry of Communications & Information Technology, Govt of India.